Mills M, Melo M. 2013. The checklist of the birds of Angola. 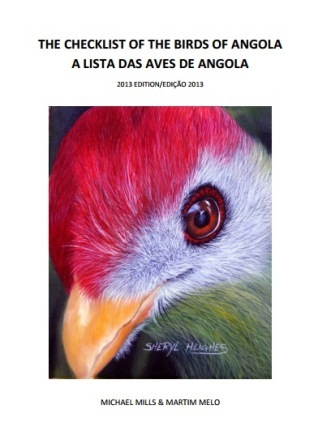 Download pdf from the Birds Angola website. From the introduction: The Checklist of the Birds of Angola is the first birders' checklist of all the birds of Angola. It was produced in order to draw together the latest English and Portuguese names for all Angolan bird species, with the aim being to assist bird scholars and enthusiasts to make sense of the rich bird diversity of the country. This checklist also draws together the available literature on Angolan birds - by cross-referencing the two main books on Angolan birds, Dean's (2000) The Birds of Angola and Sinclair & Ryan's (2003) Birds of Africa south of the Sahara - at a time when evolutionary revisions, based on genetic analyses, are resulting in rapid changes in bird names and taxonomic treatment. Sociable Weaver Philetairus socius - Should be looked for in the far south. Southern Brown-throated Weaver Ploceus xanthopterus - Likely to occur in the south-east. Lufira Masked Weaver Ploceus ruweti) - May occur at Lagoa Dilolo in Moxico. Bob-tailed Weaver Brachycope anomala - The record of Sinclair (2007, First record of Bob-tailed Weaver Brachycope anomala for Angola. Bulletin of the African Bird Club 14: 78) does not rule out Compact Weaver, and this species is more likely.